Can You Take Turmeric During Pregnancy? Normally, every woman during pregnancy needs to pay a good attention about the things she consumes as some of them can do harm to the unborn baby. It is better to be safe than sorry, even though it can be quite difficult to determine the safety of many items. This is especially true when it comes to natural substances, turmeric for example. As many studies have not been conducted it is very difficult to evaluate their effect on a pregnant woman. Can turmeric be safe while pregnant? Can You Take Turmeric While Pregnant? In general, turmeric is considered as safe as long as it is used only to spice up foods. In cases of an allergic reaction to turmeric, its consumption during pregnancy is not recommended. Also, turmeric is not safe while pregnant when used as a supplement or as an alternative medicine. If you have any concerns or doubts regarding turmeric use during pregnancy, consult your healthcare provider. For skin health: Turmeric, when used topically on the skin, is considered as safe during pregnancy. Due to hormonal changes that a woman undergoes while pregnant, skin changes and skin problems are also common, leading often to acne, skin rash, etc. In such cases, using turmeric topically can help you get rid of acne. For this purpose, you should mix turmeric with honey and apply this mixture on the affected areas of the skin, which will help reduce the skin inflammation and acne. For pigmentation: Turmeric, when used topically, is a great natural remedy for pigmentation during pregnancy. For this purpose, you need to make a smooth paste of cucumber juice, lime juice, and turmeric powder. Apply the paste on the affected areas of the skin, leaving it to do its magic for about 20 to 30 minutes. Rinse the paste using lukewarm water. When this turmeric paste is used regularly during pregnancy, it helps reduce the production of melanin which is the culprit for pigmentation during pregnancy. For spice: Turmeric is commonly used to spice up foods, especially in the Indian cuisine. This use of turmeric while pregnant is considered as safe and can even boost the immune system of the expecting mother and the unborn baby. Turmeric, when consumed in high doses, especially during the first few weeks of pregnancy, can lead to uterine muscle contractions which may cause bleeding, similar to the bleeding resulting from a menstrual period. 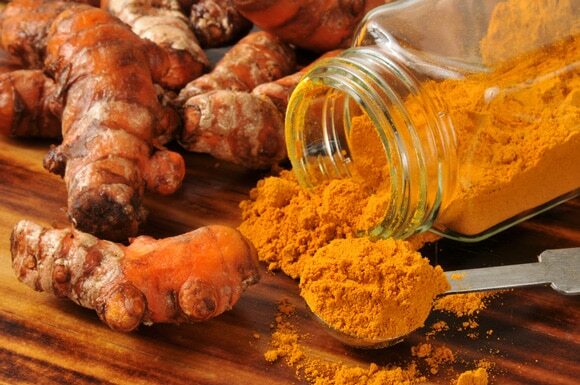 Turmeric, when consumed in high doses during the third trimester of pregnancy, can lead to preterm birth, a life-threatening situation not just only for the unborn baby but for the mother as well. Turmeric is not recommended for pregnant women who have a bleeding tendency as it has been estimated that turmeric inhibits the aggregation of the platelets and the production of clotting factors from the liver. Turmeric should be avoided also in cases when there is a genetic error of blood clotting. Turmeric is not recommended for pregnant women who plan a C-section delivery as it may slow down the healing process of the surgical wound, due to a prolonged clotting time. Turmeric, when consumed as tablets or together with milk, can lead to gastrointestinal problems such as nausea, vomiting, and diarrhea. Consumption of turmeric in large doses during pregnancy can lead to various gastrointestinal symptoms such as nausea and vomiting, heartburn, indigestion and even diarrhea. As during pregnancy women tend to have such problems because of hormonal changes, you would not want your symptoms to get worse because of turmeric while pregnant, don’t you? A good thing to know is that not all herbs are safe to use during pregnancy. For this reason, you should consult your healthcare provider first before consuming any herbal products. Remember that some herbs may contain products which are contraindicated during pregnancy, resulting in more harm than good. Even though only a few studies have been conducted so far about the safety of various herbs during pregnancy, remember that certain herbs can cause miscarriage, uterine contractions, leading to premature birth or even cause various fetal problems when used. Before taking any herbs while pregnant, the best thing to do is to consult with your healthcare provider or a herb specialist as many herbs are listed as safe in one source, while the other source may list the same herb as unsafe during pregnancy. For example, rosemary is considered as safe to use while pregnant, in amounts that you typically find in foods. However, rosemary is not considered as safe while pregnant when used in medicinal amounts as it has an impact on the uterine and menstrual flow. Remember, that even though rosemary in food is considered as safe, when used in large amounts for a medicinal purpose it can be dangerous for the pregnancy. All the other herbs such as turmeric, garlic, ginger, etc., can be contraindicated in pregnancy when used in large doses for medicinal purposes, even though their consumption in small doses, in amounts typically found in foods is considered as safe. How Much Turmeric Is Safe Per Day? Is Microwaving Food Good or Bad for You?